Rodney Wingfield (1928-2007) was born in Hackney, London within screaming distance of the scenes of the Jack the Ripper murders. He created one of Britain's most popular fictional detectives, Inspector William "Jack" Frost and his six novels have been translated into eleven languages and adapted into numerous television films. Hard Frost was a finalist for the 1996 Edgar Awards. Rodney was a fine radio dramatist and a comedy scriptwriter for Kenneth Williams. 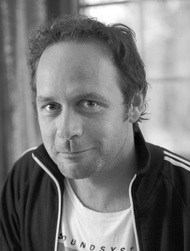 Danny Miller is a novelist, playwright and scriptwriter. His first novel, Kiss Me Quick was runner up in the CWA John Creasey (New Blood) Award. His plays have been performed at the National Theatre Studio, Bush Theatre and Theatre Royal Stratford East, and he has been shortlisted for the ITV Plays on Stage Award and the International Playwrights Award. As a scriptwriter he has written for the BBC, ITV, Channel 4, Sky and Paramount. James Henry is a novelist and the pseudonym of James Gurbutt, publisher at Corsair Books. James Henry is the author of the Frost prequel novels written by permission of the Estate of R D Wingfield.